Most college seniors across the nation are currently in the middle of another school week early in the Fall semester. Some are only going to begin classes in the next week or two. As seniors go from class to class, do their readings and homework, study for tests, and write their papers, they are keeping an eye on graduation in May or June of 2012, just months away. Some of you may be thinking, “I know how to get a job in the mall, but how do I get a real job?” The number one thing for you to do is check your college career center. Chances are that there is a career database such as a website where you can search through numerous jobs and internships that you can apply for. Find out if your college offers anything like Berkeley’s Callisto system by checking your school website or going down to the career center offices. After you check the career center, you may find out that your school is holding a career fair this semester. 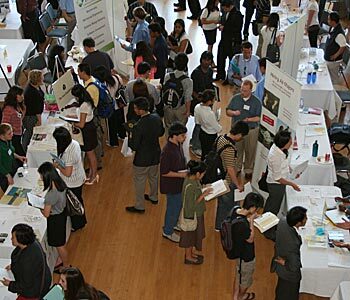 A career fair on your campus is the perfect opportunity to get a job. Companies have come to your school looking for students just like you to hire. They are seeking men and women with your current qualifications for jobs that could lead to major success in the future. Do not skip on the career fair because doing so could lose you the opportunity to meet with literally hundreds of potential employers. Of course another option is contacting people you know who have already graduated. Your friends who graduated in the last few years may be working for companies that are looking for young graduates just like yourself. Even better, your friends or contacts can inform you about what the job entails and what the job market currently is like. Through your contacts you could get job interviews or internships. By simply calling a few numbers on your phone or sending some emails to old buddies, you could gain yourself a job opportunity. And another plus, if you get the job, you may be working with a familiar face, which might make the adjustment period to the new job and schedule easier on you. Right now you are reading this and it is September 2012. We are talking about job openings for July and August 2013. That is correct, many companies are hiring students well in advance of their graduation date. Some companies are even going to begin the interview process as soon as this month. Thus, it should go without saying that you should not waste time. It is time to start handing out resumes and putting your name out there. If you go to a career fair, make sure you have many copies of your resume with you and to introduce yourself to everyone you speak with. For every contact you have or make, make sure they get a copy of your resume and that you follow up on it. Unlike the rest of your life, this is going to be one of the few times where all of the companies are coming to you and are recruiting you to come work for them. Do not stress out over this. Keep your options open. Talk to various recruiters and companies. You do not want to miss opportunities because you kept all of your focus on just the few companies you are familiar with. You never know what you are going to end up enjoying as a career. You may think there is a certain line of work that is for you, but that is not a definite thing. No matter your confidence level, you do not surely know where you will be in 10 years, so don’t close any doors on yourself and keep your options open.